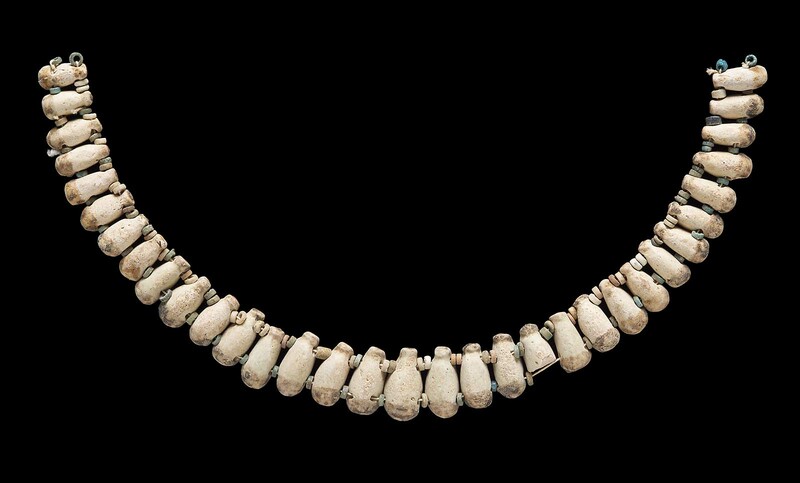 These 34 drop-shaped beads of pale faience once formed part of a broad collar. Thirty-three of the beads are currently strung together with ring beads that probably come from the same collar. One additional drop bead remains loose. A pair of similarly colored faience terminals (27-4-254) may well come from the same collar. From Giza, G 7253 D. 1927: excavated by the Harvard University–Boston Museum of Fine Arts Expedition; assigned to the MFA in the division of finds by the government of Egypt.